$819.99 Seen a lower price? Korg has brought back the ARP Odyssey for today. With the advisory assistance of David Friend, the co-founder of ARP Instruments, Korg has completely reproduced the original circuitry for artists looking to recreate classic sounds and explore new ones. Together the engineers at Korg and Arp were able to nail the sound and feel of the original. Every detail has been carefully considered to stay true to the quality of the original, down to the sophisticated semi-hard case. The ARP Odyssey was an analog synthesizer originally produced in 1972 by ARP Instruments, Inc. that garnered a faithful following among musicians. Well respected for its high value, ease to play and portability, the ARP Odyssey is loved by a wide range of musicians as a historical classic. 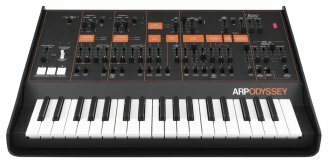 Compact body, highly operable sliders, and a slim keyboard that's easy to play The ARP Odyssey has been downsized to 86% of the original ARP Odyssey. Carefully selected parts are used in the familiar slider section, providing an operating feel that's even smoother than the original. The keyboard uses a 37-note slim keyboard that features lighter weight and excellent playability. While making the instrument more compact and easier to use, we have also paid attention to ensuring that the mini-keyboard is uncompromisingly "playable." Although the keyboard has 37 keys, the transpose function lets it cover a broad range of seven octaves. In order to deliver a more powerful analog sound, a DRIVE switch is provided as an additional function. Turning this switch on makes the VCA distort, generating a rough and raw sound. The connectors provided on the original ARP Odyssey differed by production date, but based on Rev3 of the original, the ARP Odyssey brings the specifications up to a modern standard. In addition to a MIDI IN connector and USB-MIDI port, they've added a headphone jack with adjustable volume (*). The XLR output jacks which had been unbalanced have been changed to noise-resistant balanced outputs. - Maximum Frequency Shifts: LFO sin wave, +1/2 oct., LFO square wave, +1.5 oct., ADSR, +9 oct., S/H, +2 oct. Note: VCO-1 is low note priority, VCO-2 is high note priority. - Attack Time: 5 msec. - 5 sec. - Decay Time: 10 msec. - 8 sec. - Release Time: 15 msec. - 10 sec. - Release Time: 10 msec. - 8 sec. - Keyboard CV (IN/OUT): 1 V/oct. - Dimensions (W x D x H): 19.76" x 14.96" x 4.72"
Available until 11 PM (EST) today. Mention special code 1ZT-NJ2N when you call.